This mash was my submission for the ever excellent Sound-Unsound 'Summer Booty' collection. A fusion of Booty Luv's "Some Kinda Rush" (yes I know I am addicted to them at the moment !) and Timbaland's "Fantasy" from his shock value album, this mash lulls you into a false sense of serenity before smacking you round the face a few minutes from the end. The waves you hear at the intro were recorded at Jaywick Sands, which I hear may be used for the UK version of CSI so watch this space !!!!! The car you hear is mine, a Corvette......yeah right ! 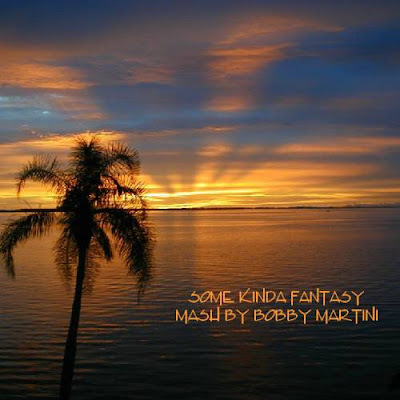 It can be found at my main 'proper' site - www.bobbymartini.co.uk on mashups page 8. Thanks for reading - I hope you like what you hear and comments are always appreciated. I have a brand new exlcusive mash that is being played live all around the world this friday on BFBS Radio 1. I won't give away too many details but all I will say is it features pop goddess Kate Bush fused with the scottish songwrting master John Reid. Who ? I hear you say - Well John Reid was the genius behind Nightcrawlers and he is now one of the UK's most prolific songwriters, writing for people such as Kelly Clarkson and Leona Lewis. If you want to hear this new mash weeks ahead of it's release then you will have to tune to Sim Courtie's Friday show. You can tune in online here or in via Sky Channel 0211 if you are in the UK or via DAB radio. This mash was a real struggle for me. I wanted to do something a bit different for Scott Johnson's 100th Ramdom Thoughts show and knowing he was a huge Depeche Mode fan, I thought it quite fitting to produce a DM themed mash. I had been playing around with the Booty Luv pella for a few days but all the tracks I matched it with were all too similar. I decided to go completely out of the box with this one and mash two very different songs and genres. This mash went through about 7 different versions before I settled for this one. I think it works and hopefully you will to. If you don't, no worries, the next mash will follow shortly ! This exquisite masterpiece can be found at the usual address www.bobbymartini.co.uk on mashups page 8. Some of you reading this may know that I have been a member of the Mashed / Pimp My Tune team right from it's infancy way back in 2006. I have chosen to leave Pimp My Tune. I won't go into reasons - it wouldn't be fair, but things basically didn't work out how I would have liked them too. That's just how life goes sometimes.